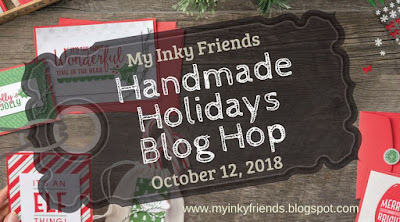 Thank you for visiting the My Inky Friends Handmade Holiday blog hop! We were given free rein on just what holiday we wanted to do, so it could be anything from Valentine's Day to New Year's. If you've been hopping since the beginning, you probably landed here from Rhonda's blog, The Stampin' Bunny. Weren't her Tiny Takeout Treats adorable?! You can continue on to the next stop (forward or backward) by following the links below. Since my kids (and even my grand kids) are grown, I don't do Halloween stuff anymore. And since we live in a very rural area now we don't get any neighborhood kids Trick or Treating, either. So I challenged myself to make a couple of Halloween projects using the Toil & Trouble DSP that I had. I didn't get the Cauldron Bubble stamp set, or the Cauldron Framelits Dies that match the stamps and the DSP, but the paper was just too cute to pass up! And a little bit of fussy cutting made up for not having the dies. 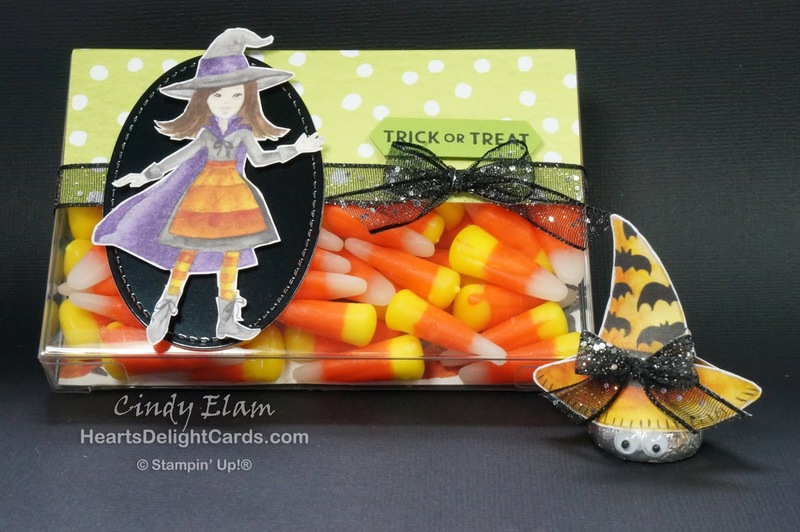 I've seen this little treat box on Pinterest using the Acetate Card Boxes, and thought it would be adorable filled with candy corn! It's super simple to make, too. Just cut an acetate card box in half crosswise and form it into an open-ended box. Cut the DSP 4-3/8" x 5" and score at 2-7/8" and 3-1/2". Fold on the score lines and insert the larger flap into the box. 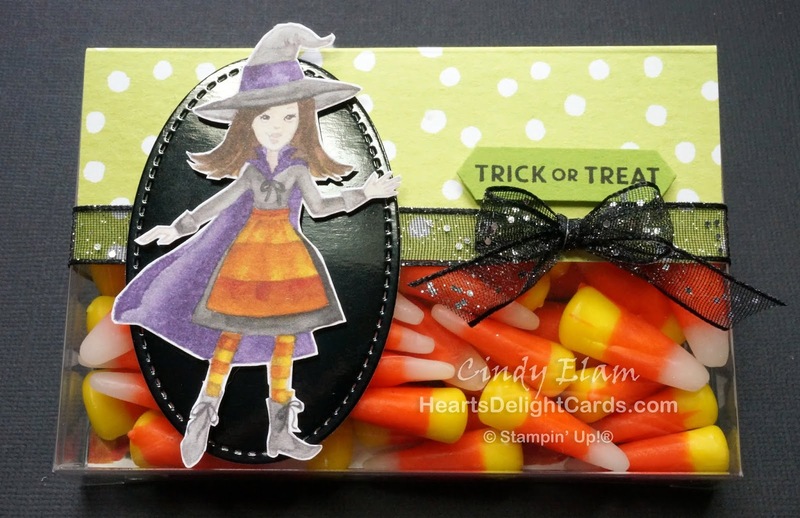 Add candy and fold the smaller flap over. You can add a glue dot to hold it while you decorate it. Add a belly band, or ribbon, or whatever your heart desires! After adding a glue dot on the front and back sides of the kiss, I slipped the hat on down to the eyes and adhered it to the glue dots. 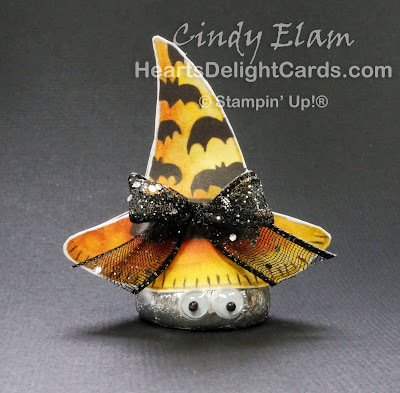 And what witch doesn't wish she had that cute Glitter Organdy bow on her hat? So fetching! Up next is Mickey over at Paper Conversation, where she's going to show you projects using Making Christmas Bright. Thanks for stopping by!